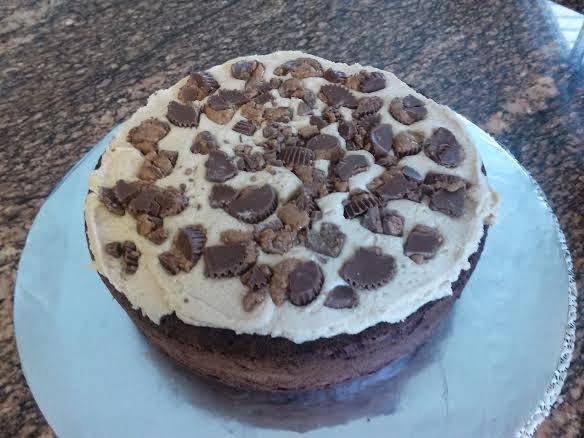 I've had many inquiries about how to make my peanut butter chocolate cake. I wonder why. Below is a very lengthy explanation of recipes, process, and tricks to making your own version of this cake. You can add or remove anything you want. If the cake is for a dinner party or I’m short on time, I use box mix. These days, it tastes just as good as most white or chocolate cake recipes I’ve had (no one ever compliments the scratch recipe more than the box mix) and box mix has the added benefit that it’s nearly fool proof. I can not vouch for anything other than chocolate or vanilla cake. I've used Pillsbury and Betty Crocker brands and like the results with both. - Use cake pans that have straight sides. Slanted edges do not produce straight cake sides. You can get pans off amazon or at a craft store (check for coupons online) for pretty cheap, probably about $20. -If you’re using box mix, buy two boxes; if you’re making the scratch version, double the recipe. You want to fill up both cake pans about 2/3 full. Some might think that is too much batter. But it will help when you level the cake tops later and this allows the cake to reach an impressive height of 4-5 inches. -I don’t care what your recipe says; I never use butter and flour to prep my pans. It has never worked for me. I always use vegetable oil spray to cover my pans and I spray it on quite liberally. The second key component of pan prep is lining the bottom of your pan with parchment paper. I have never had a cake release from a pan cleanly without parchment paper in the bottom. You can trace the bottom of your pan on a piece of parchment and then cut it out and place it in the bottom of the pan. Spray oil under and on top of the paper. -My 8 inch cakes took 50 minutes to bake through. I use a knife to check for doneness. A tooth pick won’t really reach the middle of these pretty tall cakes. Once your cakes are done baking, allow to cool in the pan. Do not remove your cake from your pan yet. Place the 8 ounces of chopped chocolate in a bowl with the corn syrup and 1 ½ ounces of butter. Heat the cream until it just begins to boil. Remove from heat and pour over the chocolate. Let stand one minute, then stir until smooth. The ganache will be very liquid while still warm. To assist the thickening process, put it in the fridge for 30 minutes. Remove and let sit until room temperature. It will be thick yet spreadable. Cream butter and shortening in mixed on high until fully incorporated. Add peanut butter and mix. Add 1/4 cup milk, and 16 oz of powder sugar. Turn the mixer on the lowest setting and take cover for the obligatory sugar cloud. You can also cover your mixer with a large towel to prevent the sugar cloud. Once powder sugar has been absorbed, increase speed of mixer to medium-high. Taste. Too dry or thick? Add more milk. Not sweet enough? Add more sugar. Not peanut buttery? Add more. This portion is really about your taste preference. The ganache is going to be very bitter and it is a nice contrast with a sweet peanut butter frosting. Set aside with a towel over the top. Before removing cakes from pans, take the longest knife you own (samurai swords excluded) and use the top edge of your pan as a level guide to slice the “muffin top” dome off the top of your cake. This is why I like using a lot of cake batter, so that the cake puffs up so high that you can get nearly a perfectly level top by cutting off the excess, which you can discard or snack on. Turn cakes out, inverting cakes onto a cutting board or mat. You want to leave the cakes upside down, where the side that you sliced the cake dome off of is facing down. Place a hefty dollop of butter cream on cake stand/cake board/plate. Place one inverted cake on top of frosting (which will act like glue and keep the cake in place). Spread a generous amount of frosting on top of the cake. This is going to be your middle layer. Rough chop about 10 Reese’s miniature cups. Sprinkle them on top of peanut butter frosting and press them into the frosting (so the next cake layer will sit level). 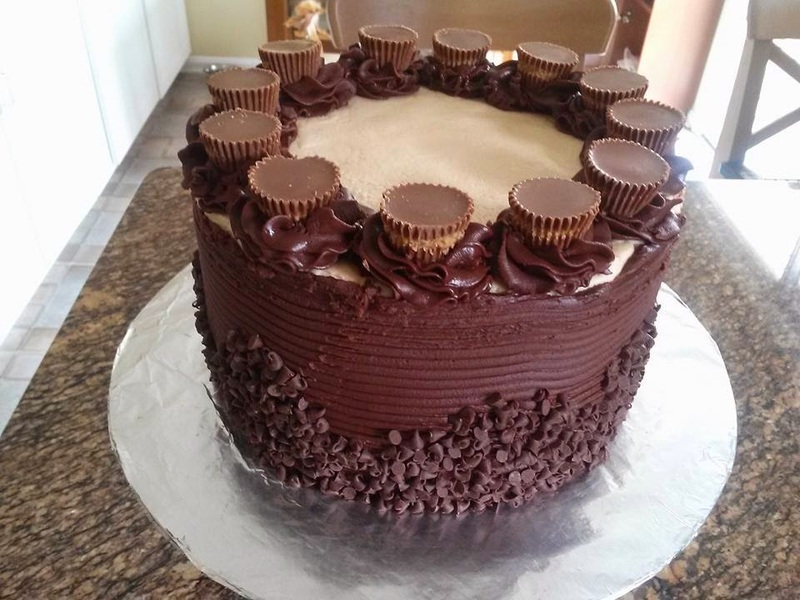 Optional: pour a bit of ganache on the top of the frosting and peanut butter cups, this will cut some of the sweetness of the frosting and the peanut butter cups. I took the pic before the ganache. Place the second cake on top, cut side down (same as the first one). Add more peanut butter frosting to the top of the new cake layer. Spread to the edge of the cake. After a few minutes, you can take a Viva paper towel or a piece of wax/parchment paper and place it on top of the peanut butter frosting. Use your hand to smooth the top of the frosting, sort of like ironing it. Be delicate. Use an offset spatula to carefully smear the ganache on the side of the cake. Having a turntable makes this process easier. I have a tool to add texture to the ganache, but if you have a knife that has a lot of serrated teeth, you might be able to achieve a similar look by holding it teeth side toward the ganache and spinning the turn table. Take a heap of mini chocolate chips in your palm, press them into the side of the cake. Most will stick to the ganache but several will not, so I like to do this over a large cookie sheet to catch all of the chips that will fall off. You can add the chocolate chips as far up as you want on the side of the cake. I like to go about half way. 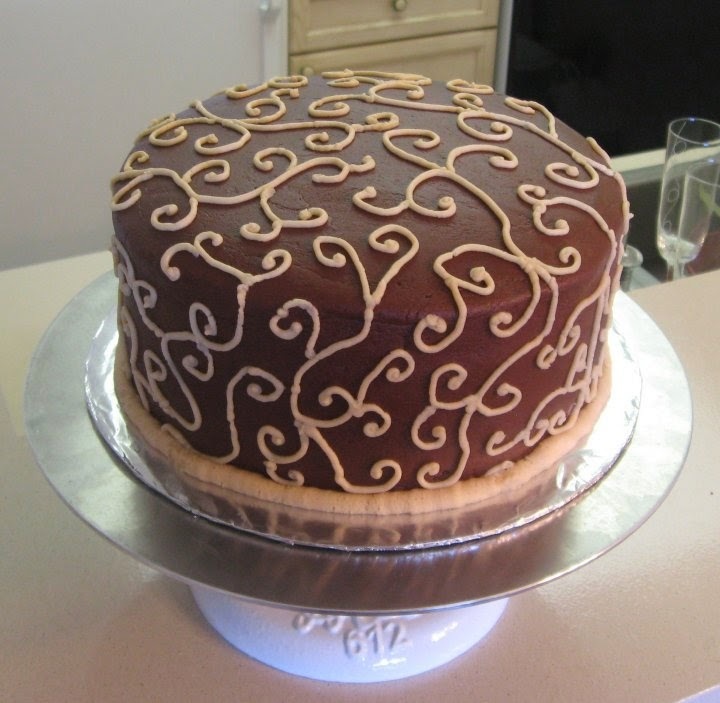 If you have a piping bag, I used a 1M Wilton piping tip to make the swirly rosettes on the top of the peanut butter frosting. (About 12 rosettes for an 8 inch cake). Place a mini Reese’s on top of each swirl. The ganache you are piping will start to melt while you are holding it in the piping bag. I place the finished cake in the fridge so the ganache will set up again. After it has firmed up, you can leave it at room temperature until you are ready to serve. After first serving, refrigerate, as ganache is cream-based. Should last up to 3 days in the fridge. Now your task is not to eat it before company arrives! This cake is a more advanced version of the first cake I ever made, a little more than 2 years ago. How the time as flown by. Chocolate peanut butter is still my favorite.